Since statehood in 1816, horse racing has taken place in Indiana. Early racing, however, was neither well organized nor fully commercialized. Races were coordinated throughout the 1800s and early 1900s, but most were held at county fairs or sponsored as special events by private clubs. Several laws were enacted over time by the state legislature to limit the scope of thoroughbred racing in the state. In particular, laws limiting the ability to place wagers on races put a hard brake on investment and development of a thoroughbred horse racing industry in Indiana. Parimutuel betting was found to be a necessity to support a sustainable, long term investment in thoroughbred horse racing operations. Parimutuel betting is a system whereby all bets of a particular type are pooled together, the "house take" and taxes (if any) are next deducted from the pool, and then payoff odds are calculated by the sharing of the pool among all winning bets. In Indiana, parimutuel betting had long been against the law. On November 5, 1968, however, a state referendum was placed before Indiana voters to allow for parimutuel betting. The referendum failed, though 46.5 percent of the voters were in favor; change appeared inevitable. Twenty years later, on November 8, 1988, Hoosiers passed a lottery referendum that, in part, allowed for thoroughbred horse racing and parimutuel betting to take place within state boundaries. On May 3, 1989, the Indiana General Assembly ratified the Lottery Act and soon after the Indiana Horse Race Commission was created to provide oversight of horse racing in the state. By the early 1990s, government sanctioned thoroughbred racing was beginning to take hold. Despite Indiana's laws restricting thoroughbred horse racing, several attempts to circumvent state laws were made by enterprising citizens. 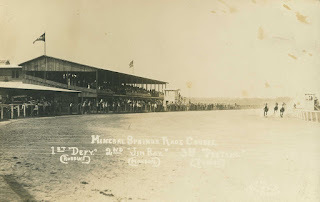 One of the most notable attempts to bring such racing to Indiana took place in 1912 at Mineral Springs, just west of Porter, Indiana, with several well known Northwest Indiana entrepreneurs promoting and investing in the venture. The 80 acre Henry Gilbertson farm, located in the west one-half of the southwest quarter of Section 34 in Westchester Township, was purchased by the Racing Foundation Corporation of America (RFCA), which organized under the laws of South Dakota. This corporation was capitalized at $500,000 and consisted of 100 shares of common voting stock and 4,900 shares of seven percent cumulative and participating preferred stock. The company's main offices were located in the new and rapidly growing city of Gary, Indiana. Initial reports of the RFCA's plan for establishing a horse racing facility in Northwest Indiana stated that the plan was to construct the track on 400 acres of land along the shore of Lake Michigan north of Porter. It is speculated that the Gilbertson farm was chosen instead for the location of the racing facility due to its close proximity to five rail lines, which would facilitate the movement of people and horses to and from the race track. These rail lines included the Lake Shore & Michigan Southern Railway, Michigan Central Railroad, Pennsylvania Railroad, Chicago South Shore & South Bend Railroad, and the newly constructed interurban line, often referred to as the Airline, operated by the Gary Connecting Railways Company (serving communities east and west of Mineral Springs) and the Valparaiso & Northern Railway (serving communities south of Mineral Springs). In fact, the Lake Shore & Michigan Southern Railway physically traversed the northern portion of the Gilbertson farm, while the Michigan Central Railroad passed about one-eighth of mile away from the farm's southern boundary. Furthermore, Gilbertson, an immigrant from Norway, was a 74 year old widower when he sold his property. Retirement from farming may have motivated him to sell his farm. He passed away on November 29, 1914, and is interred in Chesterton Cemetery. The officers of the RFCA included Armanis F. Knotts, of Gary, President; William M. Daly, of Valparaiso, Vice President; Clarence Bretsch, of Gary, Secretary and Treasurer. 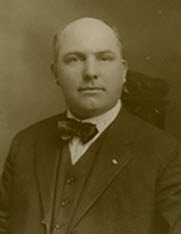 Corporate officers included John A. Gavit, of Hammond; William M. Daly, of Valparaiso; James S. Sebree, of Pierre, South Dakota; Peter H. Crumpacker, of Hammond; Lemuel Darrow, of LaPorte; Armanis F. Knotts, of Gary; and Clarence Bretsch, of Gary. 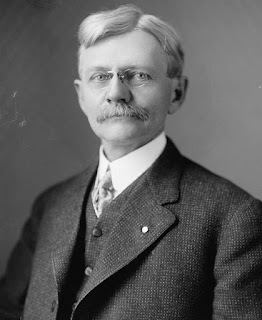 James S. Sebree was the librarian and marshal of the South Dakota Supreme Court, while all of the others named were practicing attorneys in Indiana. owned the Mineral Springs thoroughbred race track in Porter, Indiana. "The annual racing programs will be an incident only of the numerous features which will provide the widest possible range of divertisements to the membership, including golf links, tennis courts, the facilities of commodious club houses, bungalows and other appurtenances which go to make country life a joy forever to the tired city man." 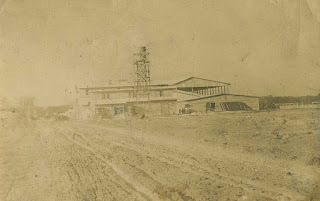 The Mineral Springs horse racing facility was to be the first major capital project of the RFCA, and the facility was leased to the Mineral Springs Jockey Club, whose membership consisted almost entirely of prominent citizens of the counties of Lake, LaPorte, and Porter. While thoroughbred horse racing was legal in Indiana at the time, gambling on races was not. As a result, little racing took place throughout the state. The Sellers Law laid out the particulars of horse racing in the state, when racing was allowed, the number of days that racing could take place over a year, as well as addressed the liability issues associated with racing. The Sellers Law was passed by the Indiana General Assembly in 1885 as House Bill No. 172 and was commonly referred to by the name by its originating sponsor, State Senator Emory B. Sellers, who represented constituents residing in the counties of Carroll, Pulaski, and White. Rather than the Jockey Club incurring potential liability, the RFCA was to absorb any potential liabilities associated with racing. The Sellers Law stipulated that horse racing could occur for a total of 45 days per year in each county, that racing could not take place for more than 15 consecutive days (each set of 15 days was referred to as a "meeting"), and that a 30 day interval of no racing must exist between each 15 day meeting. Thus, an entire season of horse racing could take place in as little as three and one-half months. "[Promoters] are banking upon the love of the sport itself by a part of their patrons. Those who must bet will make their own credit connections with pencilers, and the track will have nothing to do with it." To limit the potential for criminal liability, the officials at the track in Porter instituted a scheme similar to one in operation in New York at that time. Rather than charging a fee for booking privileges at the track, a fee was charged for "advanced information" that could be used for gambling purposes. Furthermore, neither the RFCA (owners of the racing facility) nor the Mineral Springs Jockey Club (leasee of the racing facility) would receive any revenue, either directly or indirectly, from bookmakers. two terms in the administration of President Woodrow Wilson. So how was this plan going to work operationally? Information concerning the past race history of thoroughbred horses that were to participate at Mineral Springs, including their weight, times, and placings, would be collected and published outside state boundaries. In addition, race slates and odds would also be published outside the state. This was easily facilitated since the Daily Racing Form issued by Triangle Publishing, Inc., in Chicago, was already publishing race slates and information concerning thoroughbred horses across the country. Incidentally, the Daily Racing Form initiated publication in 1894 and is still in operation today. No record of any wager would take place at the track, and no money that involved a wager would ever pass hands in Indiana. The scheme relied entirely on an accurate source of race information and a credit system - nearly an identical process to off track parimutuel betting today. The system to get around Indiana gambling laws provided an incentive to bookies to have their patrons visit the track. A patron visiting the track would pay a $1.50 or $2.00 gate entrance fee, which included railroad fare. The Mineral Springs Jockey Club would collect all gate entrance fees, fees associated with the sale of items at the track (e.g., food), and any other monies generated from thoroughbred racing at the track. These funds would then be used by the club to pay the lease fee to the RFCA. "To make satisfactory business on a strictly oral system and credit basis feasible, I suggest we form a voluntary association similar to the 'Mets' of New York, and adopt such rules and regulations that strictly oral and credit operations can be transmitted with the utmost security so far as settlements are concerned and without violating either the laws of the state, in which the track is located, or the rules against gambling, which the racetrack management will unquestionably enforce to the letter"
"The statement that Gov. Marshall has invariably prevented the resumption of racing during his incumbency seem strange in the face of two facts, the first of which is that racing is clearly legal and protected by a regulating law; the second, that there has been no attempt to revive thoroughbred racing at any point in the state during Gov. Marshall's incumbency, and further that trotting meetings [races], which are run strictly in accordance with the racing statute, have suffered no interference from the executive in so far as an exercise of legal preorogatives [Sic] is concerned." Interestingly, numerous newspaper accounts concerning Governor Marshall's position against thoroughbred horse racing at Mineral Springs strongly hinted that he may have been protecting the horse trotting and pacing syndicates against competition from thoroughbred racing. Regardless, betting on any type of horse racing was still banned in the state. 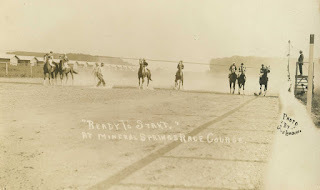 As plans for racing were being finalized, work on constructing the Mineral Springs facility was moving rapidly so that the first race could take place on September 14, 1912. Early reports indicated that the grandstand was to be built entirely of concrete, but this did not happen, perhaps due to the time constraint and cost relative to constructing the grandstand out of wood. The grandstand, complete with roof, was designed to shelter between 3,000 and 5,000 spectators from the elements. thoroughbred racing track in Porter, Indiana, circa 1912, looking northeast. The roadbed visible on the left side of the image is County Road 200 West. More than 727,000 board feet of lumber was used to construct the grandstand and buildings at the site, including a large number of horse stables. 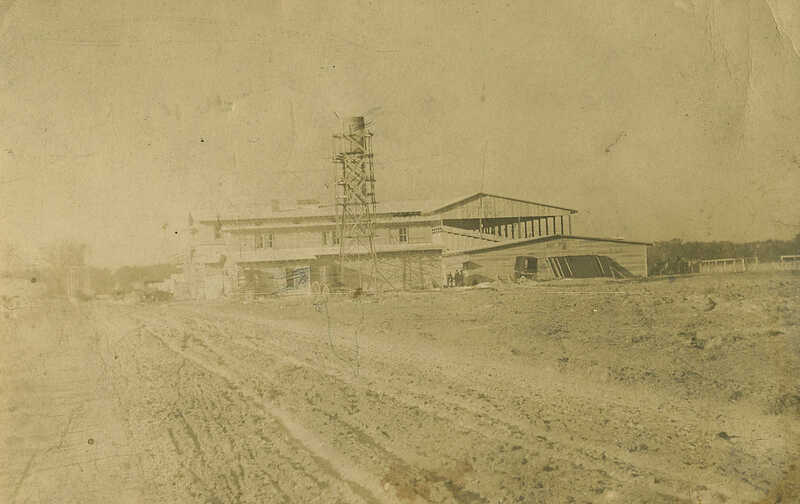 Note that the construction of the Mineral Springs racing facility came at a time when there was an acute labor shortage due to young men entering the military and a strong economy. By the end of August 1912, a call for an additional 200 carpenters and 200 common laborers was issued by the RFCA so as to meet the completion deadline of September 14. "...the promoters are of the opinion that the purposes of the track have been grossly misrepresented to the Governor, or else the rumors are being circulated by certain elements who hope to blackmail the track owners into paying them blackmail." Though racing was set to begin on September 14, a delay was incurred since the facility was not yet ready to stable horses and the oval track was not completely graded and compacted. 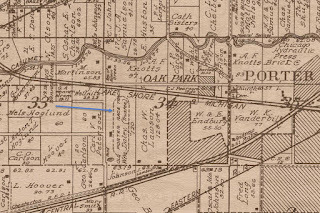 During this period, both the Lake Shore & Michigan Southern Railway and the Chicago South Shore & South Bend Railway Company constructed short spur lines to the race track. "Just because I am a candidate for office is no reason why I should sit idly by and allow the laws to be broken. Indiana is not going to be the dumping ground for Chicago gamblers.... I am old enough to remember when we had a law against ninepins in Indiana. Straightaway somebody put another pin in the alley to evade the law. That sort of thing will not go in Porter." Woodrow Wilson was elected President and Marshall served as his Vice President for two terms, from 1913 to 1921. In the October 3 issue of The Chesterton Tribune, Armanis F. Knotts, President of the RFCA made his first public presentation of his organization's revenue model. The RFCA expected to limit their expenses to $3,000 per day, or $45,000 for the 15 day meeting allowed under the law. Total average attendance was expected to be between 4,000 and 5,000, and to be drawn from the three million residents living within "easy distance" of the track. Daily gate entrance revenue was expected to be between $5,000 to $6,000 per day, revenue from concessions, refreshments, and other sales was expected to be $2,000 per day, and the revenue from the sales of news and information from the track was estimated to be $1,000 per day. Hence, total revenue per day was expected to reach $9,000, netting a profit of $6,000 per day. Over a 15 day meeting the net profit would be $90,000, or $270,000 for an entire season. As the race track facility was being completed, horses from across the country were being shipped by rail to the stables at Mineral Springs during the first two weeks of October. Horses arrived from such locales as Helena, Montana, Parkersburg, West Virginia, Saratoga, New York, Boston, Massachusetts, Louisville, Kentucky, and Toronto, Canada. Finally, racing commenced on Saturday, October 12. But it didn't. Instead of a race, a massive downpour was the main spectator event. So much rain fell that a portion of the race track washed away. As a result of the inclement weather, the track promoters postponed the opening to Wednesday, October 16. Indiana Attorney General Thomas M. Honan also rained on the RFCA's October 12 opening day, serving notice on the organization on behalf of Governor Marshall to apply to the Porter Circuit Court for an injunction restraining the RFCA from holding any races. The notice did not deter the RFCA from preparing the track for races on October 16, and on that day races did take place. More than 100 horses raced that day, and total of 140 horses were being quartered at the race track's stables. More horses were being shipped to Mineral Springs from Kentucky, Maryland, and beyond the Rocky Mountains; thus, additional stables were being constructed as racing was taking place. The RFCA was served another injunction the same week that racing began at the track. The Manhattan Lumber Company from Chicago filed suit in the Porter Circuit Court against Peter Crumpacker and the other members of the RFCA, as well as the Gary Trust & Savings Bank. The lumber company's complaint stated that on August 19 it delivered $25,000 of material to the Porter race track to be used for construction purposes. Payment was due on October 1, which was not received, and a lien was then placed on the property on October 8 due to the default.The complaint also noted that the members of the RFCA were indebted an additional $16,000 to the lumber company. The lumber company sought an injunction to have the property go into receivership, the receiver collecting all revenue associated with the race track and paying the lumber company until the debt was paid in full. From Wednesday, October 16, through Monday, October 21, thoroughbred horse racing was in full swing at Mineral Springs. That changed on Wednesday, October 23, when Indiana National Guard Troops were sent from South Bend over the South Shore line to put a halt to racing. Arriving at 12:40 pm and under the command of Major George W. Freyermuth, the troops were under orders from Governor Marshall to stop all forms of gambling at Mineral Springs. Soldiers were reportedly stationed at each gate to the track and "with menacing bayonets turned back everyone who sought to enter." No gambling was taking place at the track, no bookmakers were in sight, and no injunction had been issued prohibiting racing at the Mineral Springs race track. this image are the track's stable facilities. "A line of soldiers with bristling bayonets was immediately stretched across the track and as the race horses charged down the track the sight of the guns proved too much for the jockeys and they faltered and stopped their mounts a few feet from the threatening bayonets. The racing for the day, at least, was over." A second company of the Indiana National Guard from Rensselaer arrived later in the afternoon on October 23 under the command of Captain George Healy. Armanis F. Knotts is reported to have rushed to the Porter Circuit Court to visit with Judge Willis C. McMahan. Judge McMahon refused to hear Attorney General Honan's petition for a restraining order since the matter should be heard instead by Judge Harry B. Tuthill of the Lake-LaPorte-Porter Superior Court. Judge Tuthill's court calendar would not allow a hearing until Saturday, October 26. Thus, racing was suspended from October 23 to October 26.
in Porter, Indiana, on October 23, 1912. Source: Chicago Daily News negative collection, Chicago History Museum, DN-0059810. The stoppage of racing soon resulted in a large number of horse owners shipping their horses out by train. So few horses remained that the Indiana National Guard troops left Porter and returned to their respective headquarters. On October 26, at a hearing in Michigan City, Indiana, Superior Court Judge Tuthill refused to grant Governor Marshall a restraining order barring thoroughbred horse racing at Mineral Springs. In particular Judge Tuthill noted his concern about the state quartering its troops on private property when it was clearly not allowed by the state's constitution. "Attorney Knotts vigorously belabored the governor, saying that the executive had superseded the civil law by marshal law; that "King" Marshall had done what the colonies refused to let King George do -- occupy private property with troops, and so the declaration of independence was written." 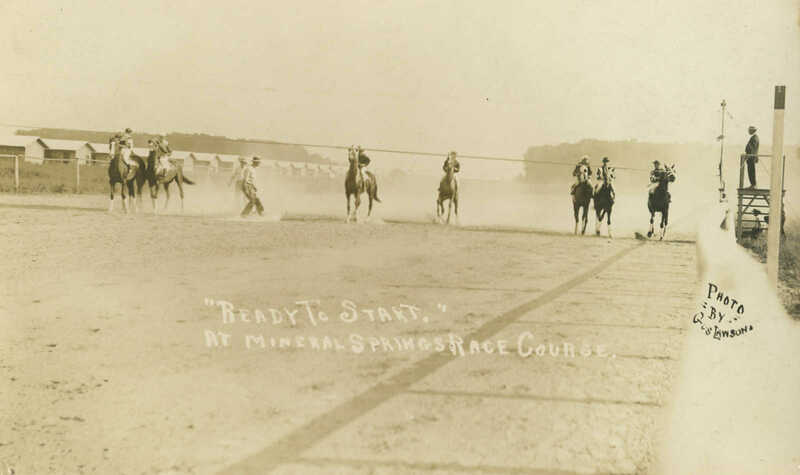 After wrangling in court, it was determined that the RFCA had the right to conduct races at Mineral Springs; thoroughbred horse racing was legal in Indiana. Now late in the year and with few horses at the track, the promoters decided to hold one more day of races on Saturday, November 2 before closing the track down for the remainder of the year. The bitterness with the Governor Marshall's action was so intense that one race held on this Saturday afternoon slate was called the "Tom Marshall Derby" and featured mounted jackasses rather thoroughbred horses. All revenue from this last day of races in 1912 was given to the horsemen as a show of goodwill by the track owners. Many of the horsemen had incurred considerable expenses getting their horses to Porter for racing at the Mineral Springs track. Only 200 spectators were in attendance on November 2; thus, the revenue was merely a token gift rather than payment for full costs incurred by the horse owners. The track was then shut down for the winter with the intent of opening for racing in 1913. Several horses were winter quartered at the track, resulting in a colony of trainers, riders, and owners residing at or near the track during the the 1912-1913 winter season. On June 5, 1913, Armanis F. Knotts announced to the press that the Mineral Springs race track would open for a 15 day stretch, as allowed by and in accordance with Indiana law, beginning Saturday, June 28. Several days later, however, it was announced that racing would begin on July 3. Over the winter months, numerous improvements had been made to the racing facility, and Knotts provided assurances that attendees to the races would find the grounds in perfect condition. When Knotts announced the plan for racing, rumors immediately began circulating in the press that the Indiana National Guard troops in Elkhart, Plymouth, Rensselaer, and South Bend would again be heading to Porter to put a stop to thoroughbred racing. 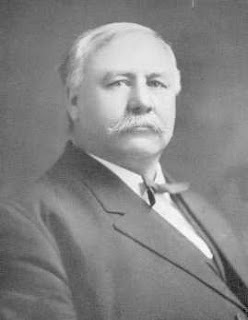 Instead, a consultation between newly elected governor Samuel M. Ralston and Indiana Attorney General Thomas M. Honan took place on June 26 concerning the Mineral Springs situation. Both Ralston and Honan were scheduled to be in Gettysburg, Pennsylvania, for a memorial service on the day races were to begin in Porter. Consequently, they decided to allow the local authorities in Porter County to monitor racing at the track, with a focus on snuffing out any gambling that may be discovered to be taking place there. County Prosecutor Walter J. Fabing and newly appointed Judge Alvin D. Bartholomew of the Porter Circuit Court were charged with enforcing Indiana's gambling laws. Meanwhile, the principals of the RFCA hired their own police force to ensure that gambling would not take place at the Mineral Springs race track. Racing indeed opened at Mineral Springs on Thursday, July 3. More than 1,200 people, most having traveled from the Chicago area, attended the opening day races under very pleasant weather conditions. The only complication that arose during the day was the cancellation of the fifth race due to a lack of horses in that scheduled event; the horses had not yet arrived by rail. Also in attendance at opening day were Porter County Sheriff William Sexton Lindall and two deputies, as well as a representative of Governor Ralston. enforce Indiana gambling laws at the Mineral Springs track. Source: Porter County Sheriff's Office, Past Sheriffs. It was suspected that betting was taking place at the Porter track. In fact, by July 5, Sheriff Lindall had arrested several individuals for alleged betting. Prosecutor Fabing's cases were weak, however, and consequently were dismissed for lack of evidence. As one newspaper reported "Fabing and Sheriff Lindall acknowledge their inability to prevent betting at the track, and Fabing has appealed to the Governor to send troops to close the race course." As had happened in 1912, the governor was being pressured to shut down the Mineral Springs track though no Indiana laws were apparently being broken. While betting was suspected to be taking place at the track, no evidence supported that suspicion. 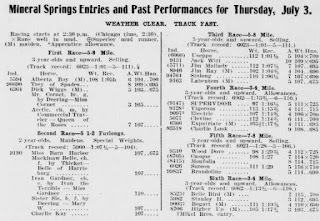 Race form published for opening day at the Mineral Springs race track, 1913. The day's feature was race four, won by Vigorous. Racing continued at the track despite the governor's, attorney general's, sheriff's, and prosecuting attorney's beliefs that gambling was taking place. The first 15 day meeting finished without government interference. The RFCA scheduled the next 15 day meeting of races to begin on August 21, 30 days after the first meeting of races concluded, following the requirement of the Sellers Law. In the interim, another entanglement between the RFCA and Governor Ralston took place. On July 23, John Gavit and Peter Crumpacker met with Governor Ralston to persuade him to not take any action at Mineral Springs when the next meeting of races were to open on August 21. At this meeting, Gavit and Crumpacker were informed that Ralston would in all likelihood send Indiana National Guard troops to the track to stop any racing, and, like his predecessor, that he was willing to put stop the racing "at the point of the bayonet if necessary." 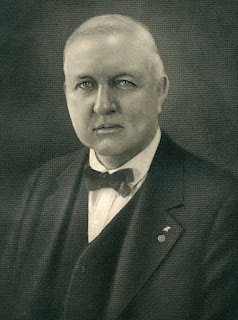 Governor Ralston stated that his action was necessary since a secret agent of the governor visited the track just before the close of the July races. The agent reported to Ralston that a system of credit betting was running "wide open" at the track. Upon hearing of Ralston's intent, Chicago bookmakers openly admitted to the governor that during the last day of racing in July that they had conducted open handbook business at the track. Crumpacker informed Ralston that neither the RFCA nor the Mineral Springs Jockey Club had promoted gambling at the track, that it had not sold any gambling permits, and that they had done all that could be done to prevent gambling in Porter. Mineral Springs track reopened for thoroughbred racing. Mineral Springs opened for a second meeting of races on August 21 as planned. However, tensions were extremely strained between Governor Ralston, the principals of the race track, and government officials in Porter County. On August 26, Ralston was informed by one of his agents in Porter that "gambling had been openly conducted" at the track. In response, Ralston instructed Adjutant General George W. McCoy to order Company E of Elkhart and Company F of South Bend, both companies belonging to the Third Indiana Infantry, to mobilize and wait further orders. in Porter, Indiana, looking northwest. related to the race shown in the postcard image directly above. "The governor decided to order out the troops after he had ascertained that the local authorities were doing little or nothing to enforce the gambling laws. It is said that he had an unsatisfactory talk over the long distance telephone with Prosecutor Walter J. Fabing at Valparaiso just before he gave the orders to McCoy.... 'I don't intend to allow the lawless element to defy the laws,' the governor said...'The sooner they are given to understand that I stand squarely for law enforcement, the better it will be for all concerned. I regret that local authorities have not handled this situation and that it is necessary to resort to drastic action to compel respect for the law.... I was told tonight that gambling at the race track this afternoon was notorious.'" On Wednesday, August 27, Governor Ralston made good on his promise to deploy Indiana National Guard troops to stop all thoroughbred horse racing at Mineral Springs. 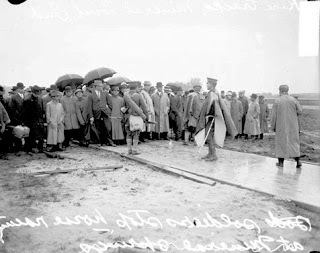 Upon arrival, the commanding officer of the troops stated his orders from the governor and all racing abruptly stopped. In fact, horse owners began removing their horses from Porter by loading them on freight trains to be transported to other tracks, such as Lexington, Kentucky. Troops encamped at the track until Monday, September 1. "It should not be necessary to use military force to stop race track gambling in Indiana. The civil law and its officers should be sufficient for that purpose. The same resolution and sense of duty as displayed by the military would render the civil force equally efficient. An impression has gone abroad in the state that the civil authorities of Porter county have been temporizing with the gamblers. Doubtless they are under strong pressure to do so. The races at Mineral Springs put considerable money into circulation in Porter county. It would be like killing the goose that lays the golden egg to stop gambling. The races are a source of income to the people." "The King of Sports is dead. The sport of Kings is dead. Long live the King. Mineral Springs is desolate and deserted." 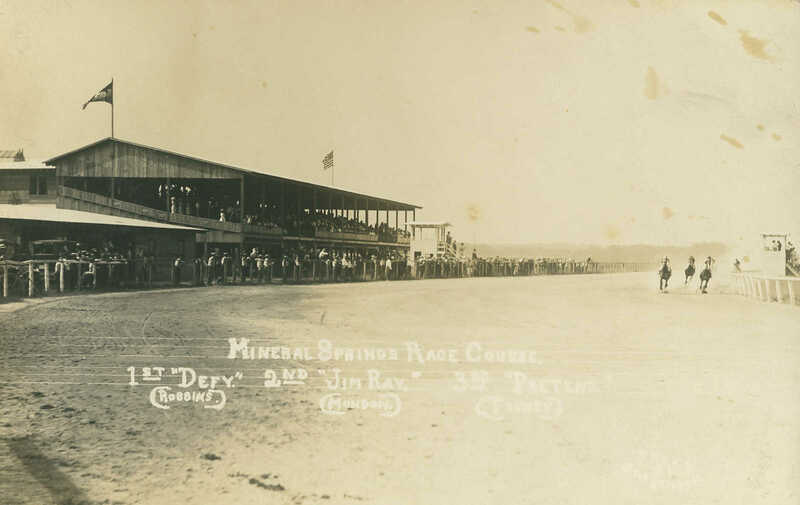 In 1917, four years after the Mineral Springs race track had permanently discontinued operations, two events took place directly related to the track. Recall the Sellers Law that was passed by the Indiana General Assembly in 1885 and regulated horse racing in Indiana? In an ironic twist, Emory B. Sellers, for which this law was named, now a judge, presided over the case of Manhattan Lumber Company versus Peter Crumpacker. The lumber company was still attempting to receive payment for over $36,000 worth of material that it had delivered to the Mineral Springs site in 1912. Judge Sellers was sitting as a special judge in the Porter Circuit Court and heard the case in September and October. A change in venue was taken from Judge Sellers and Judge Walter A. Funk of South Bend was assigned the case. Ultimately, the race track syndicate comprised of Clarence Bretsch, William A. Cain, William Daly, Peter Crumpacker, John A. Gavit, Armanis F. Knotts, and James R. Malone was compelled to pay the judgment reimbursing the lumber company for materials. "During the terrific electrical storm of last Wednesday night a great deal of damage was done. The race track grand stand burned, the siding of Wm. Bross' house was torn off where the telephone is stationed, seven pigs of Mr. Charlson, of Baillytown, were killed, E. Spencer's best milch cow was killed -- one of many such losses to farmers -- and the chimney of John Carlson's house was wrecked." "The electrical storm of early Thursday morning did considerable damage in this section of the county. The grand stand of Mineral Springs race track was fired and destroyed by lightning. The structure cost $25,000 to build, and is a total loss as there was no insurance. The beautiful home of L. H. Robbins, in Portage township, was seriously damaged. The big fireplace was struck, and three sides of it torn down, leaving the fourth side standing alone. Falling brick did some damage, but fortunately the house did not catch fire. At Baillytown a stack of hay owned by C. J. Johnson was destroyed. The Farmers' Mutual paid $50 for this loss. Five pigs were killed for S. O. E. Charlson, and the Farmers' Mutual settled for $50. E. C. Spencer had a cow killed by lightning, and he was paid $60 by the same company. The home of William Boo was struck and considerable damage sustained. A corn crib owned by Herman Gustafson was also struck." Little physical evidence exists today suggesting the location of the thoroughbred horse racing facilities located at Mineral Springs; no grandstand, no stable buildings, and no track remain. 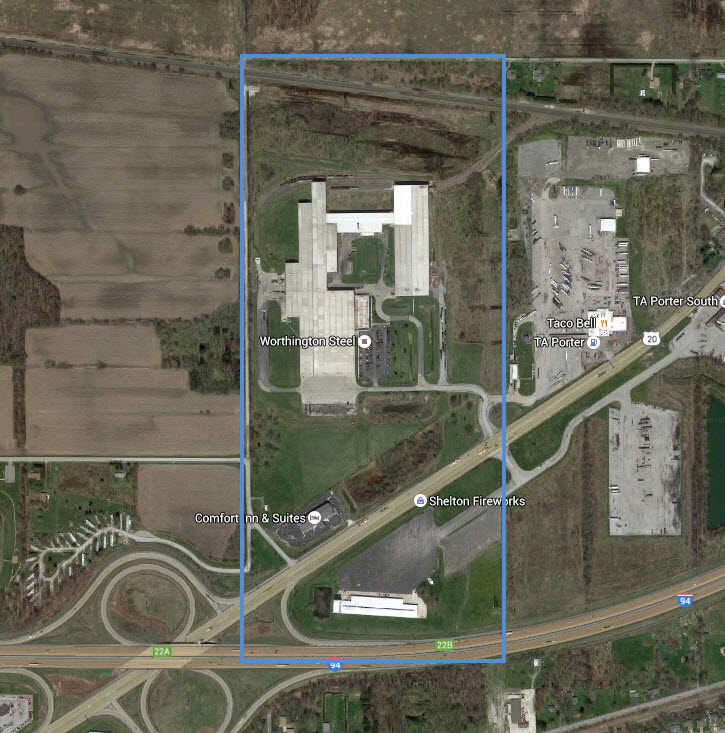 The southern boundary of the property is now traversed by Interstate 94, and U.S. Route 20 passes through the southern one-half of the former track property. 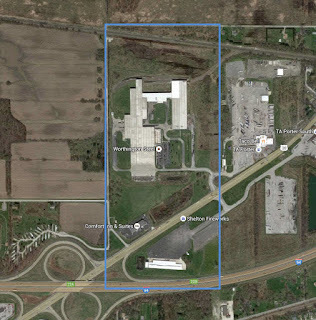 Structures owned by Worthington Steel sit upon the location of the oval track and grandstand, while a Comfort Inn & Suites hotel and Shelton Fireworks building are situated where once was located the southern end of the track. Today, people passing by the property on Interstate 94 and U. S. Route 20 likely have no idea that troops once encamped on this bit of land, using bayoneted rifles to put a stop to thoroughbred horse racing in Indiana. outlined in blue, in Porter, Indiana, 2015. Hmurovic, John. 2014. The Battle of Mineral Springs. Indiana Magazine of History 110(2):97-119. The Chicago Daily Tribune, Chicago, Cook County, Illinois; August 1, 1912; Volume 71, Number 184, Page 14, Column 1. Column titled "Indianians Back of Turf Revival. Business Men of Gary, Hammond, Valparaiso, and LaPorte Launch Project." The Chicago Daily Tribune, Chicago, Cook County, Illinois; August 7, 1912; Volume 71, Number 189, Page 16, Column 1. Column titled "Plans Ready for New Race Course. President A. F. Knotts Comes Here to Talk Details with Contractors" by Harvey T. Woodruff. The Chesterton Tribune, Chesterton, Porter County, Indiana; August 8, 1912; Volume 29, Number 20, Page 2, Column 3. Column titled "Racetrack a Sure Go. Public Announcement is Made of Plans to Revive Thoroughbred Racing." The Chicago Daily Tribune, Chicago, Cook County, Illinois; August 21, 1912; Volume 71, Number 201, Page 8, Column 5. Column titled "'Bookies' to Form Governing Body. 'Bud' White Suggests Organization to Operate at the New Porter Track." by Harvey T. Woodruff. The Chesterton Tribune, Chesterton, Porter County, Indiana; August 29, 1912; Volume 29, Number 23, Page 1, Columns 1 and 2. Column titled "500 Jobs are Looking for Men. An Unprecedented Demand for Workmen of All Kinds in This Vicinity." The Chesterton Tribune, Chesterton, Porter County, Indiana; August 22, 1912; Volume 29, Number 22, Page 1, Columns 1 and 2. Column titled "Race Track is a Busy Place." The Chesterton Tribune, Chesterton, Porter County, Indiana; August 29, 1912; Volume 29, Number 23, Page 1, Column 4. Column titled "Work is Rushed at Race Track. Site of New Mineral Springs Track is a Busy Scene of Activity." The Chesterton Tribune, Chesterton, Porter County, Indiana; October 3, 1912; Volume 29, Number 28, Page 8, Columns 1-3. Column titled "Horses are on the Way. Several Carloads of Racers Leave Helena, Montana, for New Track." The Chesterton Tribune, Chesterton, Porter County, Indiana; October 10, 1912; Volume 29, Number 29, Page 1, Columns 2-4. Column titled "All is Ready at the Race Track." The Chesterton Tribune, Chesterton, Porter County, Indiana; October 17, 1912; Volume 29, Number 30, Part 2, Page 1, Column 4. "Asks for Injunction. Manhattan Lumber Co. Sues for Value of Material Furnished Race Track Company."." The Chesterton Tribune, Chesterton, Porter County, Indiana; October 17, 1912; Volume 29, Number 30, Part 2, Page 1, Column 6 and Page 8, Column 3. Column titled "Race Track in Operation." The New York Times, New York, New York County, New York; October 23, 1912; Volume 62, Number 19996, Page 10, Column 3. Column titled "Indiana Soldiers Seize a Race Track. With Fixed Bayonets Prevent Racing at Mineral Springs and Drive Away Spectators." The Chesterton Tribune, Chesterton, Porter County, Indiana; October 24, 1912; Volume 29, Number 31, Page 1, Column 6 and Page 5, Column 4. Column titled "Militia Closes the Race Track." The Chesterton Tribune, Chesterton, Porter County, Indiana; October 31, 1912; Volume 29, Number 32, Page 1, Column 6 and Page 2, Columns 3 and 4. Column titled "Marshall Law Reigns Supreme. Departure of Troops Marks the End of Racing at Mineral Springs Course." The Chesterton Tribune, Chesterton, Porter County, Indiana; November 7, 1912; Volume 29, Number 33, Page 1, Columns 1 and 2. Column titled "Races End for Season." The Chesterton Tribune, Chesterton, Porter County, Indiana; June 12, 1913; Volume 30, Number 12, Page 1, Column 6. Column titled "Race Course to be Opened June 28." 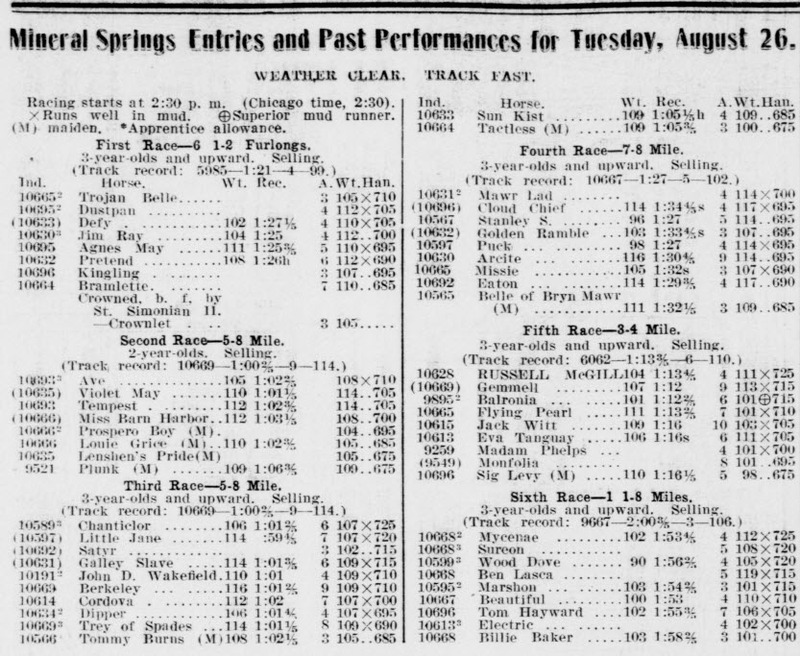 Daily Racing Form (Triangle Publications, Inc.), Chicago, Cook County, Illinois; July 3, 1913; Page 1. Item titled "Mineral Springs Meeting to Open Today." The Chesterton Tribune, Chesterton, Porter County, Indiana; July 3, 1913; Volume 30, Number 15, Page 1, Column 3. Column titled "Mineral Springs Race Track Opens. Second Attempt to Hold Racing Here is Made. The Governor Says 'Betless Racing' or Nothing." The Chesterton Tribune, Chesterton, Porter County, Indiana; July 3, 1913; Volume 30, Number 15, Page 1, Column 6. Column titled "Steps to Prevent Gambling. Governor Ralson Places Porter Track Situation in Hands of County Officials." The Cincinnati Enquirer, Cincinnati, Hamilton County, Ohio; July 4, 1913; Volume 70, Number 185, Page 9, Column 3. Column titled "Mineral Springs. Gets Away to a Good Start Without Any Interference." Daily Racing Form (Triangle Publications, Inc.), Chicago, Cook County, Illinois; July 3, 1913; Page 6. Item titled "Mineral Springs Entries and Past Performances for Thursday, July 3." Daily Racing Form (Triangle Publications, Inc.), Chicago, Cook County, Illinois; July 4, 1913; Page 3. Item titled "Mineral Springs Form Chart." The Cincinnati Enquirer, Cincinnati, Hamilton County, Ohio; July 8, 1913; Volume 70, Number 189, Page 7, Column 2. Column titled "Gives Up the Ghost. Sheriff and Prosecutor Say They Cannot Stop Betting at Porter." The Chesterton Tribune, Chesterton, Porter County, Indiana; July 10, 1913; Volume 30, Number 16, Page 1, Column 1. Column titled "Racing Opens at Mineral Springs." 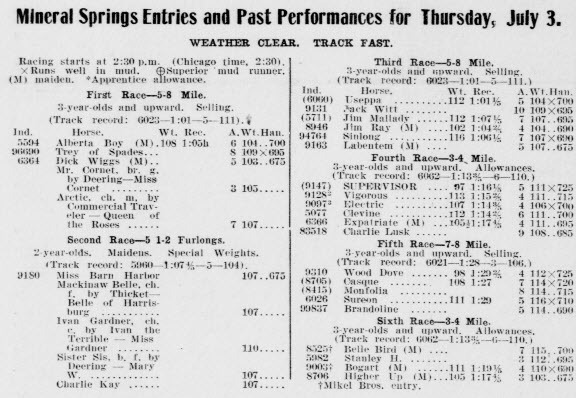 Daily Racing Form (Triangle Publications, Inc.), Chicago, Cook County, Illinois; July 11, 1913; Page 1. Item titled "Purse Money Again Promptly Paid. Horsemen Continue to Get Tangible Evidence of Financial Improvement at Mineral Springs." The Chesterton Tribune, Chesterton, Porter County, Indiana; July 17, 1913; Volume 30, Number 17, Page 4, Column 2. Column titled "Mineral Springs Track Notes. Fifteen Days Will Slose [Sic] Saturday. Next Meet Begins August 21." The Cincinnati Enquirer, Cincinnati, Hamilton County, Ohio; July 18, 1913; Volume 70, Number 199, Page 7, Column 4. Column titled "Entries and Weights. Mineral Springs." The Chesterton Tribune, Chesterton, Porter County, Indiana; July 24, 1913; Volume 30, Number 18, Page 1, Column 3. Column titled "First Racing Meeting Ends. Owners of Mineral Springs Course Fix August 21 as Date for Next Meet. Plans for the Second Meet of the Year are Made in Spite of Governor Ralston's Promise of Troops." The Indianapolis News, Indianapolis, Marion County, Indiana; July 25, 1913; Volume 64, Number 198, Page 9, Column 4. Column titled "Lake County Men Call on Governor Ralston. Crumpacker Talks of Mineral Springs Track." Daily Racing Form (Triangle Publications, Inc.), Chicago, Cook County, Illinois; August 26, 1913; Page 4. 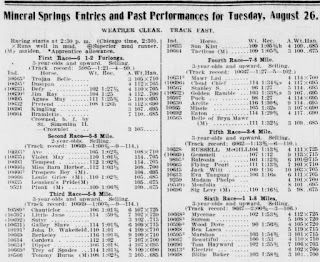 Item titled "Mineral Springs Entries and Past Performances for Tuesday, August 26." The Courier-Journal, Louisville, Jefferson County Kentucky; August 27, 1913; Volume 120, Number 16310, Page 9, Column 7. Column titled "Governor to Stop Gambling. Troops Ordered Ready to March on Mineral Springs Unless Law Observed." The Chesterton Tribune, Chesterton, Porter County, Indiana; August 28, 1913; Volume 30, Number 23, Page 1, Column 6. Column titled "Ralston Holds Troops ready to Stop Porter Betting. Indiana Governor Orders Two Companies in Readiness to March to Track." The Chesterton Tribune, Chesterton, Porter County, Indiana; September 4, 1913; Volume 30, Number 24, Page 1, Column 5 and 6 and Page 6, Columns 1-6. Column titled "Will Begin Suit for $50,000 Damage. A. F. Knotts Says that Governors Marshall and Ralston Will be Asked to Pay for Closing of Track." The Indianapolis News, Indianapolis, Marion County, Indiana; September 4, 1913; Volume 64, Number 233, Page 4, Column 5. Column titled "Civil Law Should Be Ample." The Indianapolis Star, Indianapolis, Marion County, Indiana; September 8, 1917; Volume 15, Number 95, Page 4, Column 3. Column titled "State Briefs. Valparaiso." The Chesterton Tribune, Chesterton, Porter County, Indiana; September 27, 1917; Volume 34, Number 28, Page 3, Column 2. Column titled "Porter News. Contributed by Porter People." The Chesterton Tribune, Chesterton, Porter County, Indiana; September 27, 1917; Volume 34, Number 28, Page 4, Column 3. Column titled "Local, Personal, Social." The Indianapolis Star, Indianapolis, Marion County, Indiana; November 20, 1917; Volume 15, Number 168, Page 4, Column 3. Column titled "Judge Shepard to Hear Case Against Crumpacker." The Porter County Vidette, Valparaiso, Porter County, Indiana; December 5, 1917, Page 7, Column 6. Column titled "Noted Mineral Springs Race Track Case Ends Today." The Vidette-Messenger, Valparaiso, Porter County, Indiana; October 28, 1937; Volume 11, Page 23, Columns 1-8. Column titled "Famous Trials Took Place in Historic Court House." © 2015 Steven R. Shook. All Rights Reserved.